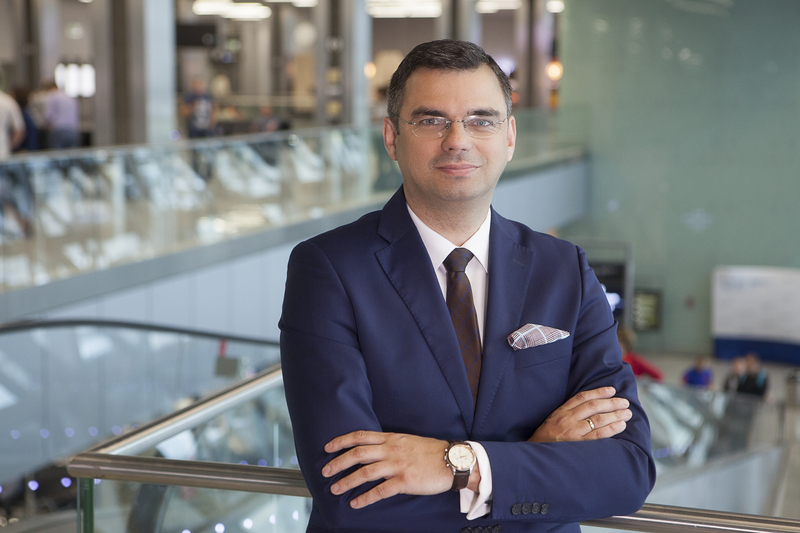 Radosław Włoszek, CEO of Kraków Airport, reveals the airport’s investment plans, how it is driving non-aeronautical revenues, and the importance of putting the passenger first. What are the challenges for today’s airports? Airports should address how the aviation market has evolved in recent years when developing their strategies. This includes the change in the level of customer awareness and the improved availability of routes and travel planning tools. Another important goal for airports is to maintain the upward trend in the share of revenues generated from non-aviation business. Airport planning and infrastructure development must address safety and the needs of its users. To this end, the development of an airport should be a key element in a strategic long-term objective for regional development. The acquisition of a new partner always confirms a well-chosen and implemented airport growth strategy, which will also take into account the potential of the city and region. Education is the best way to improve and promote innovation and travel safety, as well as attract and engage potential employees. In 2017, Kraków Airport opened the Aviation Education Centre. The first of its kind in Poland, the facility sheds light on aviation in an interesting way and is suitable for various age groups. How important is it for an airport to provide a seamless and enjoyable service for its passengers? Kraków Airport adjusts its services to the needs of the various passenger groups – business travellers, families travelling with children, passengers with disabilities and those travelling with pets. A VIP service and loyalty programme – Kraków Airport Loyalty – is also available. As many as 14,700 users from around the world have already downloaded the airport’s free mobile application, which is fully integrated with the airport information system and blog. Passengers can also benefit from the support of airport staff via Kraków Airport’s social media platforms and the Need Help service. What new developments is Kraków Airport currently working on? In 2016, Kraków Airport completed one of the largest investment plans in its history. A new terminal was built in the characteristic shape of an inverted prism, and several investments were made to the airport’s operations, including the renovation of taxiways and the extension of the apron. Over the next 20 years, Kraków Airport plans to invest PLN 1 billion in infrastructure. Passenger traffic forecasts show that the airport will serve up to 12 million passengers by 2036. The necessary investments include expanding the passenger terminal and apron and moving cargo operations to a different location. However, the most important investment task faced by Kraków Airport is the construction of a new runway. Kraków is one of the most recognisable and popular tourist destinations in Europe, but Kraków and Małopolska are also dynamically developing business centres, with a human resources base of nearly 200,000 students in over 20 universities. Kraków Airport is a crucial element of the region’s economic development. Consequently, the airport is guided by corporate social responsibility in its day-to-day business operations. An illustration of this is that Kraków is the first regional airport in Poland to publish a sustainability report. What are Kraków Airport’s priorities regarding route development? Since 2017, we have launched 39 new routes. We now operate more than 110 routes by 23 carriers to four continents. Our regular transatlantic connection to Chicago returned in 2017, and a new route to Dubai was added in April 2018. Our route network is growing in many directions with both low-cost and legacy airlines expanding their offerings.